Lee John Westwood OBE (born 24 April 1973) is an English professional golfer. Noted for his consistency, Westwood is one of the few golfers who has won tournaments on five continents – Europe, North America, Asia, Africa and Oceania – including victories on the European Tour and the PGA Tour. Westwood was named player of the year for the 1998, 2000 and 2009 seasons. He has won the 2000 European Tour Order of Merit, and the renamed 2009 Race to Dubai. Westwood has frequently been mentioned as one of the best golfers without a major championship victory, despite several near misses including three runner-up finishes. He has represented Europe in ten Ryder Cups. In October 2010, Westwood became the World number one golfer, ending the reign of Tiger Woods, and becoming the first British golfer since Nick Faldo in 1994 to hold that position. He held the number one position for a total of 22 weeks. Westwood and countryman Luke Donald are the only two golfers to reach the number one world ranking despite never winning a major. Westwood had a later start at the game than many future tournament professionals, but less than two years later he was the junior champion of Nottinghamshire. In 1990 he won his first amateur tournament, the Peter McEvoy Trophy. In 1993 he won the British Youths Open Amateur Championship and turned professional. Westwood has won 23 events on the European Tour and has also won tournaments in North America, Africa, Asia and Australia. His most successful year to date has been 2000 when he won seven tournaments worldwide and was ranked first on the European Order of Merit, ending Colin Montgomerie's long run of European Tour dominance. His win on the Sunshine Tour's Dimension Data Pro-am in 2000 made him the first golfer to win events on all 6 of the International Federation of PGA Tours. Justin Rose is the only golfer to have joined him on this list. Westwood returned to the winners circle in 2007 by winning both the Valle Romano Open de Andalucía and the Quinn Direct British Masters to bring his total European Tour wins to 18. As a result, he moved back into the top 50 of the Official World Golf Ranking. Westwood finished the 2007 season with five top 10 finishes in the last five events. He carried this form into the 2008 season, starting with two tied second places and a fifth, moving back into the top 20 in the world rankings. At the Masters, Westwood finished tied for 11th and he narrowly missed out on becoming the first European in 38 years to win the U.S. Open, finishing 3rd on level-par. Westwood rejoined the PGA Tour for the 2012 season, stating that "It felt right in a Ryder Cup year" and intimated that he would like to experience the challenge for the FedEx Cup in the end of season playoffs for the first time. In February 2012, Westwood recorded his best ever performance at the WGC-Accenture Match Play Championship when he reached the semi-finals for the first time. In all eleven previous attempts he had never once made it past the second round. He beat Nicolas Colsaerts, Robert Karlsson, Nick Watney and Martin Laird en route before falling, 3&1, to Rory McIlroy in the semi-finals. He finished in 4th place after losing the consolation match to American Mark Wilson, 1 up. Had he won the tournament, he would have regained the number one ranking. At the 2016 Masters, Westwood finished joint runner-up with Jordan Spieth, three strokes behind winner Danny Willett. He was briefly only one stroke off the lead during the final round following an eagle on the par five 15th, but bogeyed the 16th to end his chances. This was the third time Westwood has finished as runner-up in a major championship. At the 2016 U.S. Open, Westwood was again near the top of the leaderboard after the first three rounds, but playing in the penultimate group during the final round he fell away badly shooting a round 80 (+10) to finish T32. Westwood, with 80 starts, has the second most major championship appearances without winning, behind Jay Haas who played 87 majors. On 31 October 2010, Westwood became the World number one golfer, ending the reign of Tiger Woods. He remained World number one for 17 weeks, before being replaced by Martin Kaymer who held the top spot for 8 weeks. Westwood regained the number one spot after winning the Indonesian Masters on 24 April 2011 and held it for 5 weeks before being replaced by Luke Donald. He spent over 350 weeks in the top-10. For the 2012 and 2014 tournaments, Westwood was once again a member of winning teams, with Europe beating USA at Medinah Country Club and Gleneagles. In 2016, his friend Darren Clarke was captain and he was once again chosen as a wildcard, this time part of a losing team for the first time since 2008. In 2018, Thomas Bjørn selected Westwood as one of his five vice-captains for the 2018 Ryder Cup at Le Golf National, alongside Graeme McDowell, Luke Donald, Pádraig Harrington and Robert Karlsson. Westwood married Laurae Coltart, the sister of Scottish Ryder Cup player Andrew Coltart, in January 1999. The couple have two children, Samuel Bevan and Poppy Grace. He is good friends with fellow Ryder Cup star Darren Clarke and from April 2006 he co-owned a private jet with him. Westwood divorced Coltart in 2015 and he now lives in Jesmond, Newcastle upon Tyne. In 2007, Westwood was presented with an Honorary degree of Doctor of Science by Nottingham Trent University. The University named its sports hall after the golfer in October 2010. He announced the creation of the Lee Westwood Golf School in 2010, which offers young golfers the ability to combine golf training with their education as part of their school life. In addition, since 2010 Westwood has created a Junior Lee Westwood Golf Tour and Lee Westwood Golf Camps. In recognition of his work with young golfers, he was awarded with the Golf Foundation's 'Spirit of Golf' Award just before the Open Championship, an award which was previously held by Gary Player and Tony Jacklin. Westwood's interests include films, snooker and cars. He is also a big football fan who supports Nottingham Forest. He also supports and sponsors his local semi professional side Worksop Town FC. Westwood is a follower of Dumfries based football club Queen of the South, most likely due to having Andrew Coltart as a former brother-in-law, who himself is a passionate supporter of the Scottish club. Putter: Ping Sigma 2 Fetch (4° of loft). Called a fetch putter because it can be used to retrieve the golf ball out of the cup. ^ Facey, David (1 November 2010). "Westy is a smash hit". The Sun. Retrieved 31 January 2011. ^ Ferguson, Doug. "Westwood of England Now Considered Best Player to Never Win a Major". PGA of America. Associated Press. Retrieved 16 December 2013. ^ Myers, Alex (August 2013). "The 11 Best Golfers Without a Major". Golf Digest. Retrieved 16 December 2013. ^ "All-Time Best Without a Major". Golf.com. Archived from the original on 16 December 2013. Retrieved 16 December 2013. ^ "Official World Golf Ranking". Archived from the original on 25 May 2012. Retrieved 24 May 2012. ^ "Week 4 2008 Ranking" (PDF). Official World Golf Ranking. 28 January 2008. Archived from the original (PDF) on 25 June 2008. ^ "Westwood Hails US Open Campaign". BBC Sport. 16 June 2008. ^ "Westwood secures Portugal victory". BBC Sport. 18 October 2009. Retrieved 24 October 2009. ^ "Lee Westwood wins Race to Dubai title". BBC Sport. 22 November 2009. Retrieved 22 November 2009. ^ Reason, Mark (11 April 2010). "Masters 2010: Phil Mickelson holds off Lee Westwood to claim third green jacket". Telegraph. Retrieved 12 April 2010. ^ "Donald overtakes Westwood at the top of the world rankings". BBC Sport. 29 May 2011. Retrieved 29 May 2011. ^ "Lee Westwood leads after shooting career-best 60 in Thailand". BBC Sport. 15 December 2011. Retrieved 17 December 2011. ^ "Lee Westwood follows career-best 60 with round of 64". BBC Sport. 16 December 2011. Retrieved 17 December 2011. ^ "Lee Westwood triumphs by seven shots at the Thailand Open". BBC Sport. 18 December 2011. Retrieved 19 December 2011. ^ "Lee Westwood makes run to semis in WGC Match Play". PGA Tour. 26 February 2012. Archived from the original on 28 February 2012. Retrieved 27 February 2012. ^ "Westwood bemoans putting at Augusta". Sky Sports. 10 April 2012. Retrieved 10 April 2012. ^ "Lee Westwood wins Nordea Masters for the third time". BBC Sport. Retrieved 10 June 2012. ^ Inglis, Martin (6 November 2017). "Lee Westwood: Golf needs to be 'more playable'". bunkered. ^ "Lee Westwood charges to Nedbank Golf Challenge victory". Sky Sports. 11 November 2018. Retrieved 11 November 2018. ^ "2018 Nedbank Golf Challenge purse, winners share, prize money payout". 11 November 2018. Retrieved 11 November 2018. ^ "With this win-Lee Westwood". 11 November 2018. Retrieved 11 November 2018. ^ "Lee Westwood becomes world number one as Kaymer falters". BBC Sport. 31 October 2010. ^ Garside, Kevin (1 November 2010). "Lee Westwood wrests world No 1 ranking off Tiger Woods". Telegraph. Retrieved 9 November 2010. ^ "Lee Westwood wins Indonesian Masters to regain top spot". BBC Sport. 24 April 2011. Retrieved 24 May 2011. ^ "Lee Westwood - Advanced Statistics". Official World Golf Rankings Advanced Statistics. ^ "Clarke and Westwood confirmed as Ryder Cup wildcards". Irish Independent. 3 September 2006. Archived from the original on 3 March 2016. Retrieved 3 September 2006. ^ "European players record". Ryder Cup. 7 March 2008. ^ "Westwood targets Faldo's record". This is London. 7 March 2008. Archived from the original on 16 April 2008. ^ Dorman, Larry (4 October 2010). "McDowell Lifts Europe to Ryder Cup Victory". The New York Times. Retrieved 4 October 2010. ^ Corrigan, James (20 September 2014). "Europe's Lee Westwood relishing his role as US tormentor-in-chief at Gleneagles". The Telegraph. ^ "Ryder Cup 2016: USA Regains Trophy At Hazeltine – How It Happened". Ryder Cup. 2 October 2016. ^ "Lee Westwood named among Thomas Bjorn's vice-captains for Ryder Cup". The Independent. 22 May 2018. ^ "Lee Westwood". BBC Sport. 18 September 2006. ^ "The Man". Lee Westwood Archive Site. Archived from the original on 14 December 2007. Retrieved 22 November 2007. ^ "Westwood moves on from divorce". ^ "Westwood opens new facilities". ^ a b "University names sports hall after golfer Lee Westwood". BBC News. 22 October 2010. Retrieved 31 October 2010. 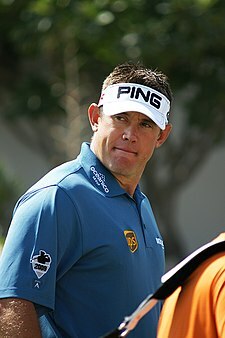 ^ "Lee Westwood Golf". Lee Westwood. ISM. 2009. Retrieved 29 July 2009. ^ "Westwood recognised for contribution to junior golf". The Open. Archived from the original on 17 July 2009. Retrieved 29 July 2009. ^ "In brief: Lee Westwood, Sir Alex Ferguson". Queen of the South FC. ^ "Lee Westwood – Career Record". PGA European Tour. ^ "Lee Westwood". Ping Golf. Retrieved 4 February 2019. ^ "Lee Westwood Wins Nedbank Golf Challenge with Ping's New Fetch Putter". Golf Magic. 12 November 2018. Retrieved 4 February 2019.